Al tomar esta clase usted se hace practicante de Reiki. Reiki es una tradición iniciada por el monje japonés Mikao Usui hace más de 100 años. El Reiki produce una profunda relajación y combina perfectamente con la práctica de masaje. Durante el curso usted aprende además de los principios del Reiki, cómo colocar las manos para ofrecer un tratamiento y cómo aplicar el Reiki con masaje. Al final de la clase usted recibe un "attunement" que abre los canales que le permiten canalizar lo que en Reiki se conoce como "energía universal" para que ustede pueda de ahí en adelante contribuir a su sanación y la sanación de otra persona. "Sanación" se refiere no necesariamente a la desparición de los síntomas físicos o mentales sino a una consciencia más elevada que se traducirá en una vida más satisfactoria y balanceada. El programa de la clase se adjunta más abajo. Enjoy this retreat-like weekend when you will be initiated to Reiki as a natural healing practice. You will also have the opportunity to meditate and relax. By the end of the day you will feel energized and rejuvenated. The Reiki level I class combines lecture, discussion and hands on. 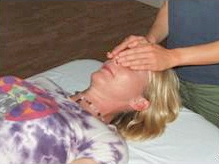 You will learn how to administer Reiki treatments and how to use Reiki on yourself. You will also become part of our Reiki community, where the doors are wide open to new practitioners. You will have the opportunity to give and receive reiki treatments through our reiki circles. REIKI is a natural healing method we owe to Mikao Usui. The word REIKI comes from two Japanese words: Rei, meaning universal energy and Ki, meaning the energy that animates all living being (equivalent to the Chinese word Qi, and the word Prana for Hindus). When Rei and Ki flow harmoniously together, we are in optimal physical, mental, emotional and spiritual health. REIKI means our connection with the universe, our restitution to the whole. Blockages to the flow of energy at any one level of our being manifest as symptoms or disease. In REIKI, the practitioner funnels universal energy for himself or other person with the intention of supporting healing. Healing is not solely the disappearance of a symptom, but a complete resolution of the causes of disease. This implies a process of personal evolution. It is a principle of REIKI, common to other energy healing modalities, that vital energy nourishes the organs and cells and when this energy is blocked or impeded, the body cannot continue to work well. If you want to know more about Reiki, go to English pages to find more information about Reiki and holistic health.